Experience the comfort and ease of our transportation service available to the first 48 passengers from most south and west side resorts. Hotel pick-up starts between 5:30 and 6am to get you out on the water bright and early. More space to steal away for those romantic moments. Definitely the way to impress your date! Our Snorkel Sail Deluxe offers snorkel stops at two of Maui's most vibrant reefs, Molokini crater and Turtle Arches in South Maui. You can participate in a guided "snorkel safari" with our trained water specialist; snorkeling on reefs that are abundant with sea life, including the green sea turtle, an endangered species. 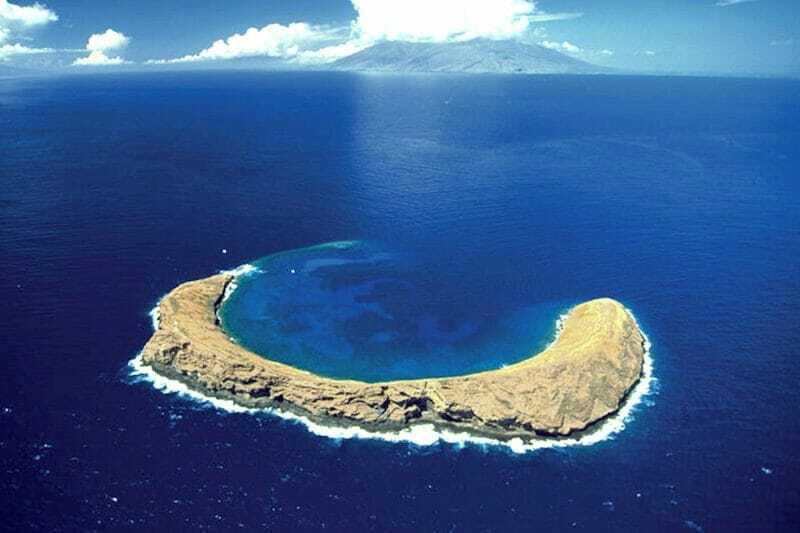 Molokini is an ancient crater located inside a marine reserve. Expect spectacular water clarity and a pristine coral reef. Rated one of the best snorkeling spots in the world, this reef has a stunning variety (more than 400) of reef fish and animals, many of which (more than 25%) are only found in Hawaii. Occasionally we see dolphins, whales, manta rays, and sometimes the rare Hawaiian monk seal. December through the end of April is also a great time to see Humpback whales in the National Marine Sanctuary. 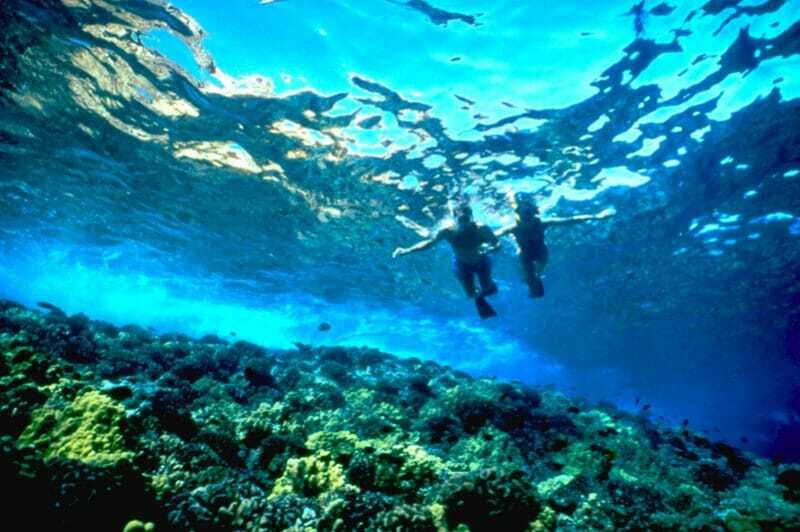 Turtle Arches is located off the South Maui shores near Makena State Park and offers a large coral reef system. The caverns and ledges in the coral and lava create the perfect habitat for sponges, coral, octopus, fish, eel, lobster, and shrimp. The highlight of this reef is the number of Honu or Sea Turtles that gather to be cleaned by fish known as Hawaiian Cleaner Wrasse. Educational guided snorkel tours referred to as the "Snorkel Safari"
Scuba Diving for certified divers is offered at no additional charge with your own gear. Rental gear available for $75. Complimentary transportation for up to 48 passengers provided for most West and South side hotels and condominiums. Breakfast of scrambled eggs & bacon, assorted croissants, bagels, muffins with cream cheese, butter, and jellies, granola, fresh island fruits and fruit yogurt. Full gourmet buffet-style lunch with award winning kiawe/guava smoked pulled pork, marinated teriyaki chicken thighs, Asian lo mien noodles with vegetables and sesame dressing, hummus with pita, classic caesar, potato-mac salad, cole slaw, fresh fruit and white chocolate macadamia nut cookies. COMPLIMENTARY TRANSPORTATION FOR THE FIRST 48 PASSENGERS - Leave the driving to us! Experience the comfort and ease of our transportation service available from most south and west side resort areas. Our comfortable vans will pick up and return you to your hotel or condo in style. NOTE: Transportation must be selected. Please ensure hotel/condo information is provided. IF YOU CAN SNORKEL, YOU CAN HUKA DIVE! Huka Diving is a unique way to enjoy the wonderful underwater world. You don't need to be certified or take classes. This is a surface supplied air system that allows the participant to actually go under the water while breathing from a surface supplied air system. Dive without cumbersome tanks and gear. Enjoy the freedom of movement, just as you would when snorkeling, below the surface. You be 10 years of age or older and pass a medical review. Any cancellation made after 9pm local time, 2 business days prior to the activity will be subject to a charge of 100% of the total amount. This is an excellent catamaran boat and service!!!!! They really cater to your needs and makes sure you’re prepared for the experience! They provided all the equipment, towels, sun blocks food and beverage! There’s even a shower to wash off the salt water. My fiance and I did the deluxe snorkeling and the romantic sunset dinner feast! It was absolutely memorable!